The last step in a pool heating system installation should be the installation of a pool cover. The pool cover will both conserve the heat in the pool and extend the overall swimming season. The use of a pool cover is extremely important in reducing heat loss from the swimming pool. Therefore, most installation companies always include a pool cover with the solar pool heating system. 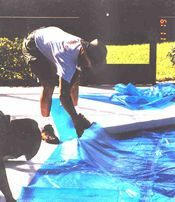 In this case, the installer is cutting the pool cover to the exact size of the swimming pool. For more information on pool covers, see the FSEC document Pool Heating Questions & Answers. The pool cover has been cut and is now covering the swimming pool water. The use of the solar system and the cover will help extend the swimming season. The final steps include providing the homeowner a system homeowner's manual and explaining how the system works. This includes instructing the homeowner on how to determine that the system is working, the function of the various components, and who to contact for future questions.